Web development provides several vector graphics API. One of them is called D3.js and let users create interactive charts. D3.js is a bit complicated, so NVD3 was created upon it to draw common statistical figures. NVD3 plots are very nice and higly interactive! You can easily plots advanced histograms and scatter plots. Gfx is a Lua script that start a “tty server” . This server will listen to a folder. Whenever a file is created/modified in this folder, the server send an update to the client. Pictures can be saved as svg or PNG by a simple click. To my mind, this is the best library. 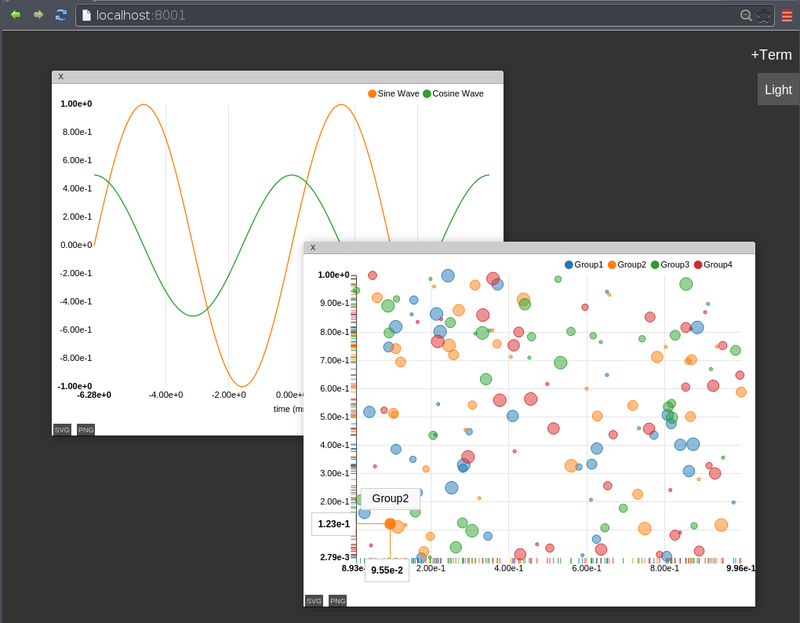 You can barely plot everything if you are familiar with jQuery/d3.js. The Lua wrapper is a bit slow while using big Tensors. This can become an issue if you want real time plotting abilities.